Friday evening I was sitting beside one of my daughters waiting for a performance to begin. Knowing we would have an hour wait, I took a book. 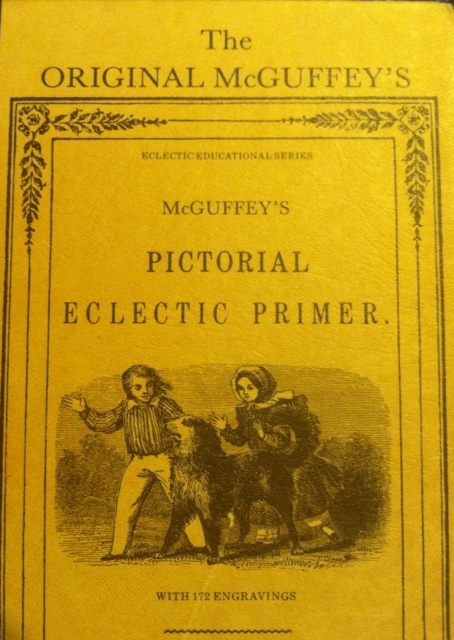 It is a reprint of a McGuffy reader used in the late 1800’s. I love this book for several reasons ~ the large print that makes reading so much easier for the brain to process, the lessons that break words into syllables, and the text that allows the child to practice the words that have been learned. Friday evening I added another reason to this list ~ the figurative language that develops the comprehension skill of inference. First, Lulu read the passage. I asked her to tell me about it. 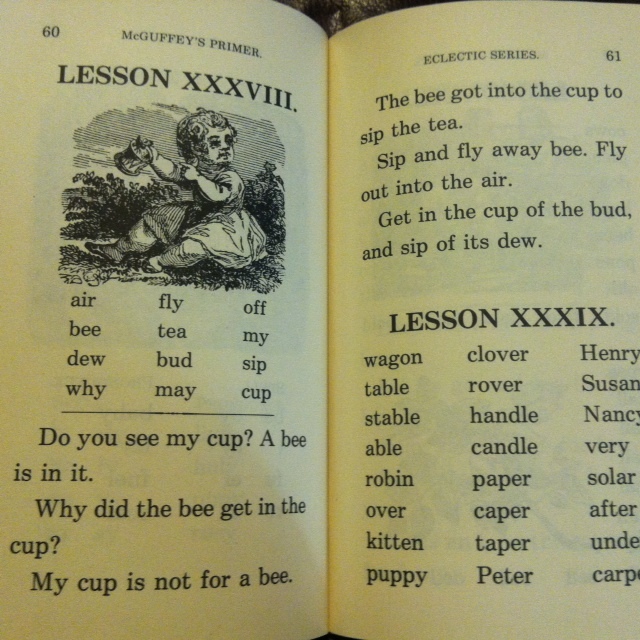 Of course, what she understood from the passage was literal – that a bee had gotten into someone’s cup of tea. Next, I read the text to her. As I read, I stressed the lines that say, “My cup is not for a bee…. [hmm? ]” The intonation in my voice caused her to realize there was something else to glean. “‘Get in the cup of the bud, and sip of its dew.’ What does the cup of the bud mean?” Ah! She didn’t know what “bud” nor “dew” meant, so I told her. Just like that, two new definitions were linked to words she had heard before but didn’t understand ~ instant vocabulary lesson! Now that she understood these two words, I repeated the line slowly, “Get in the cup of the bud.” I painted a picture in her mind saying, “Imagine a new, young flower bud, wet with the morning dew.” Ding, ding! The “ah-ha” moment happened. She understood that the text was talking about a bee drinking from a flower bud in the early morning. It was just 15 minutes, but in that time, she practiced reading; she learned the meanings of two words; she practiced inferring meaning from text. This is what can happen when we “lie down [bedtime stories], wake up [school or church], walk along the way [doing life together]” as Deuteronomy 6 so eloquently states. Look for those unexpected, blessed moments when life merges with education and learning happens naturally.